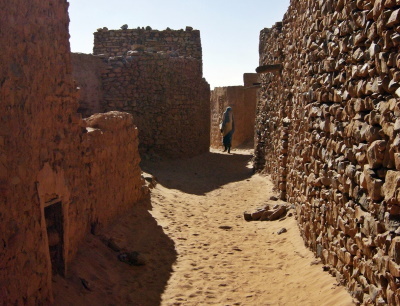 The Ancient ksour of Ouadane, Chinguetti, Tichitt and Oualata are trading and religious centres along the ancient Sahara trade routes. These four towns date from the 13th and 14th century. Chinguetti was a principal gathering place for pilgrims of the Maghrib to gather on the way to Mecca. It became known as a holy city in its own right, especially for pilgrims unable to make the long journey to the Arab Peninsula. Although largely abandoned to the desert, the city features a series of medieval manuscript libraries without peer in West Africa. Looking at a map of Africa/Mauritania and, bearing in mind the lack of any review on this site so far, you might conclude that the Ksour of Mauritania do not receive many tourist visits! In fact 3 very cheap charter flights each week (October –April) between France and the northern town of Attar bring relatively large numbers of (mainly French?) tourists to Chinguetti and Ouadane. The other 2 inscribed towns are further east and south – more appropriate perhaps for those travelling on to Mali (Oualata is the next “town” to Timbuctoo – only a week or so’s camel journey away!). If you read the ICOMOS review on the UNESCO web site you will see that ICOMOS had to have its arms twisted to make a positive recommendation – largely because of the towns’ lack of preservation. “Old Chinguetti” consists of a few lanes of stone built structures – many empty or falling down but reasonably faithfully preserving the 12h century layout together with some of the decorative features. The Mosque itself (Photo – top) is well preserved and its attractive tower looks to have been largely reconstructed (Non Muslims are not allowed to enter but you can see/hear the religious activity from its doors). We received the usual statement about it being the “7th most holy city of (Sunni) Islam”. On enquiring about the 4th to 6 th (after Mecca, Medina and Jerusalem of course) we were given a long list of candidates including Cairo, Kairouan, Damascus, Fez, Marrakech and Baghdad. Somewhat illogically, although these alone would have taken the placings up to 9, we were still assured that Chinguetti fitted in at 7th! Indeed, lacking too much in the way of buildings, Chinguetti “majors” on its scholarly reputation (which reached its peak in the 17th-19th centuries) and there is a large number (10-15?) of family “Biblioteques” scattered around the town offering views of “old” Islamic libraries for an entrance fee in 2007 of 1000 Ougiya per person (c 3 euro) – these do NOT figure in the nomination documentation or inscription criteria. We visited that of Ahmed Mahmoud, not far from the mosque, and it was certainly an interesting and pleasant hour, providing an opportunity to see inside one of the old structures and hear about its history and the way of life from a lively (and well practiced!) speaker (French, Arabic and the Mauritanian dialect of Hassaniya). It helped bring Chinguetti to life for me. Oudane sits a further 80kms or so east across the dunes. This makes for an interesting 4x4 drive avoiding the longer “piste” but is NOT a journey to be attempted with a single vehicle unless driven by an expert sand driver who knows the area (and carries a satellite phone?!). Ouadane is altogether larger and more spectacular right from its first viewing. The old town (photo - bottom) is even more ruined than that of Chinguetti but its positioning on a cliff face is more spectacular. Unfortunately large parts of it are used as the town rubbish dump. Entrance to the old area costs 1000 Ougiya and only lasts for the day of issue – this is a nuisance, since many people will arrive fairly late after the dune drive and will want to leave in the morning on the next day. Yet the town is best seen in the 2 different lights of morning and evening. Good views can be had however from outside the walls at the bottom of the cliff. In all honesty, after taking in the situation and atmosphere, there is not a great deal to see - 1 hour for each visit is more than enough in the heat. There are few stone structures in Mauritania, where the villages consist mainly of huts, tents and simple mud/concrete blocks. The architecture and mode of construction (a mixture of stone held together with clay mined from deep underground) is interesting and perhaps too easily overlooked. These towns are much smaller than Timbuctoo and I perhaps felt the “call of the desert” and closeness to the days of camel trains supporting Saharan trade, pilgrimages to Mecca and Islamic scholarship, more than I did in Mali. This might possibly be due to the “dune journeys” involved in getting there but also because neither has yet fallen prey to what UNESCO calls the “brutal urbanisation” of Timbuctoo. In both Chinguetti and Oudane a new town has sprung up but, in both cases, is just separated enough from the old such that its awfulness does not intrude - yet!. 'Threatened' by Drought or Desertification: Chinguetti. "The city is seriously threatened by the encroaching desert; high sand dunes mark the western boundary and several houses have been abandoned to the encroaching sand." Desert Cultural Landscapes: Crit iii "The Ksour bear unique witness to a nomadic culture and trade in a desert environment. " Salt: Oualata (Walata) was a centre of salt trade. Ibn Battuta: visited Oualata in 1352. Wrote ""My stay at Iwalatan (Oualata) lasted about fifty days; and I was shown honour and entertained by its inhabitants. It is an excessively hot place, and boasts a few small date-palms, in the shade of which they sow watermelons. Its water comes from underground waterbeds at that point, and there is plenty of mutton to be had." Mosque: Chinguetti, the Great, "Friday Mosque" - created by the city founders sometime in the thirteenth or fourteenth century. The minaret of this ancient structure is supposed to be the second oldest in continuous use anywhere in the Muslim world. 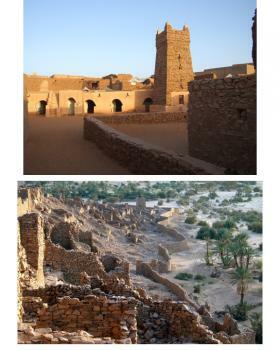 At Ouadane are the remains of and old mosque, and a new one closely modelled upon it. 16 Community Members have visited.